CAD is being empowered by the oil prices and also USDCAD will be under the influence of Crude Oil Inventories announcement today. 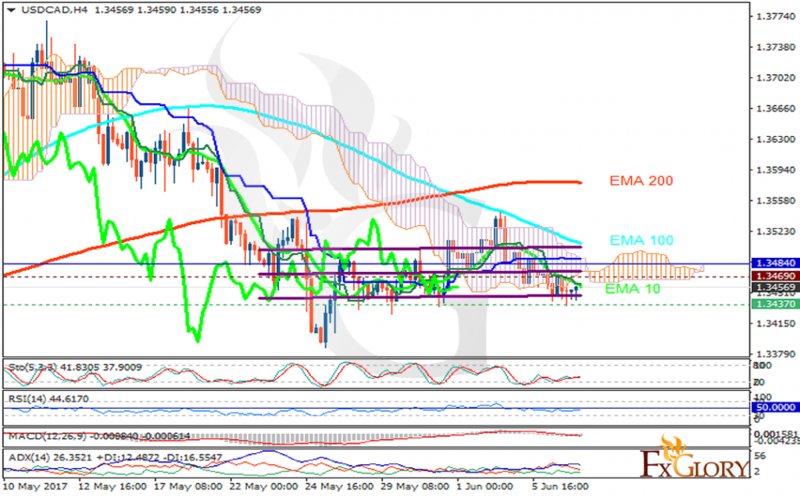 The pair is finding support at 1.34370 with resistance at 1.34690 which both lines are below the weekly pivot point at 1.34840. The EMA of 10 is moving with bearish and it is located below the EMA of 200 and below the EMA of 100. The RSI is falling towards the oversold area, the MACD indicator is in negative territory and the Stochastic is showing upward momentum. The ADX is not showing any clear signals. The price is below the Ichimoku Cloud and the Chinkou Span. The Tenkan-sen is showing a downward trend while the Kijun-sen is showing a horizontal trend. The trend direction is chiefly made by the Crude Oil Inventories announcement however the support level breakthrough will smooth the way for further decline targeting 1.34 otherwise the price will grow to 1.35.